Tell Cahoot about yourself to become a mentor. 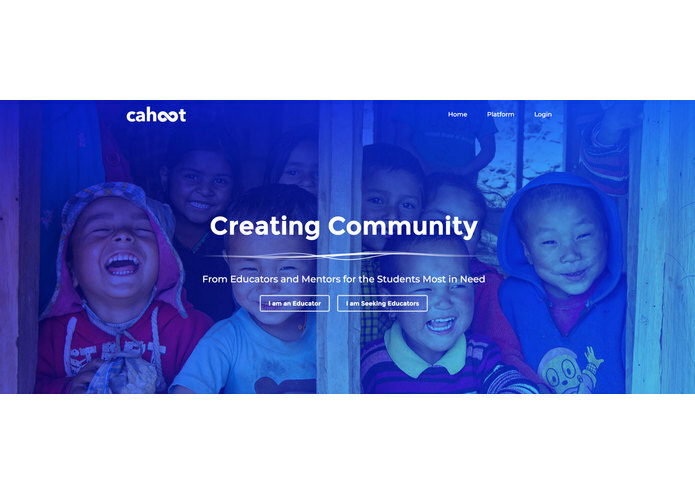 Since its creation earlier this year, Cahoot has inspired educators, students, and the Diyalo Foundation to experiment with this unique idea building educational communities without borders for those that need it most. In the weeks after the original project submission, we have recruited more educators and experts, expanded technical capability of the web platform, and worked with Diyalo to prepare a pilot run for their fall curriculum in Nepal. We have recruited additional educators from across the United States willing to lend expertise in Creativity and Design, Computers, Programming, Electronics, Agriculture, Language, Writing, and Business. These educators have at least a bachelors degree, and some have a masters degree in their field. All of us are looking forward to the opportunity to connect great mentors with children who can put the expertise to work. The Diyalo Foundation created its first primary school for rural Nepalis in 2016. That was a seminal moment for this organization and has inspired growth in their team and fundraising over the past year. With wind in the sails, the Diyalo Foundation is preparing to create a second school in Nepal around early 2019. Through this experience the foundation intends to further its mission of bringing education to those that need it most. We are working closely with the Diyalo Foundation through this process and have developed a digital “mentorship curriculum” in Cahoot where Nepali educators can seek experts in an on-demand capacity to complement their standard education. Unlike modern online education courses, Cahoot should not be seen as a replacement for education but as a complementary experience. For example, a teacher in Nepal may be teaching young teens basic computer coding skills. This is a valuable skill and may be especially liberating in rural regions of the world because these children can tap into the digital economy, find work, and create a career regardless of their geographic location. With Cahoot, these children can find mentors they need to grow their skills and professional community on top of their primary education and regardless of their location. We are very excited about the opportunity that lies ahead. Through the Facebook Developer Community Challenge, we hope to generate even more momentum for Cahoot to bring expertise from anywhere in the world to rural Nepalis and build a supportive community that otherwise would not exist. Working closely with our partners at the Diyalo Foundation, we have an opportunity to integrate with new educational infrastructure and intend to support and improve it with a powerful digital component. Stay tuned for more updates as we get in cahoots with the communities that need us most. Original Cahoot submission is below. As a result of economic, cultural, and political challenges the national primary education in rural Nepal is among the worst in the world. Students are taught by rote memorization and most children in the fourth grade are unable to perform addition with numbers greater than one digit. Fewer than 33% of students who enter the first grade finish the 10th grade. In 2015 a generation-defining earthquake destroyed much of the educational infrastructure throughout the country. This leaves the children of rural Nepal with few to no options for attending school and acquiring a full education. Several groups are working to solve the infrastructure and school rebuilding challenge, such as the Diyalo Foundation, but there are still challenges acquiring the right educators and resources to create a quality educational experience for the children. 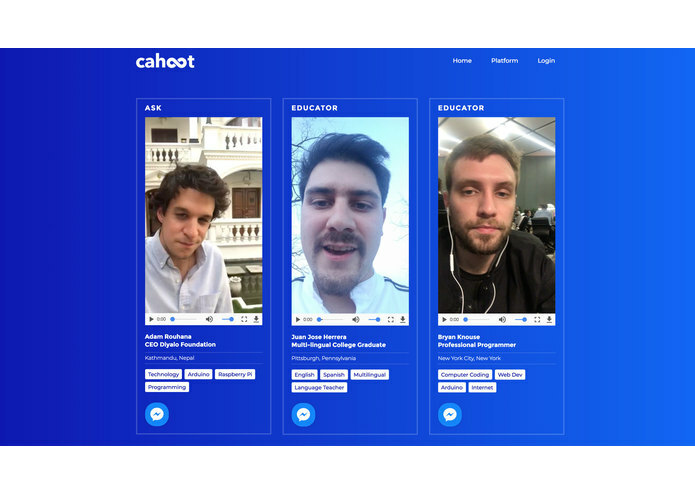 Cahoot is a digital platform that connects mentors and educators to the students who are seeking their knowledge regardless of geographical limitations. In rural Nepal, the schools are rarely complemented by sufficient educational resources. Cahoot is designed to fill this absence. Cahoot offers an easy method for students or student administrators to make an "Ask", or a request for an educator such as this "Ask" from Diyalo Foundation CEO Adam Rouhana. The ask is a brief video where students or their administrator provide a background on the educational experience they seek. Cahoot matches the "Ask" to educators and/or mentors who can fulfill the need, whether they live in the community, elsewhere in Nepal, or thousands of miles away in another country. The student administrator making the "Ask" may then connect with educators via the Facebook Messenger platform, a widely used communications platform to quickly start a conversation and see if the fit is right for the educator and the students. Mentors and educators may create an account on Cahoot by talking to a Facebook Messenger bot and telling the app a little about themselves. Utilizing an automated chat bot can speed up the information gathering, identity validation, and matching function of the platform to provide a fast and seamless experiences getting onboard Cahoot. The sought after educational experiences can span a variety of topics from traditional subjects like mathematics and science to more targeted regional activities such as farming, working with technology (such as arduinos), and learning a spoken language. Through Facebook Messenger and other digital technology, Cahoot affords an intuitive experience for a community to acquire precisely the education that is relevant to their needs. Moving forward, it is possible that an educator/mentor may develop a strong relationship with a class. Cahoot will continue to support this ongoing educational relationship that may reflect an evolving lesson plan similar to the structure of education in the United States. Cahoot is built as a cloud software application that leverages the Facebook Messenger platform. The cloud application is built to handle logic and routing of data, while messenger is the primary interface that individuals - both students and educators - utilize to interact with one another. As Facebook Messenger already has rich communications capabilities available, it is an effective solution to work alongside an educator-student matching application. In addition, Cahoot takes care to maintain the strongest privacy and security available today to protect the identities of our students. None of the students identities are revealed until it is agreed by both the educator and the student administrator to engage in an education experience. Cahoot also makes use of a biometric voice authentication system for user-login that is intuitive, fast, and exceptionally secure for maintaining user privacy. Connecting all the pipes is challenging, integrating FB Messenger into a cloud app and moving data around effectively. With more experience, this process should become more efficient. We intend to acquire an initial cohort of educators through friends, family, and school connections. Many students (high school and college) in the United States are eager to lend their time and knowledge toward meaningful volunteer work and we believe we can tap into those networks to seed a foundational group of educators. Consequently, we plan to test Cahoot with a group of students supported by the Diyalo Foundation in Nepal to determine the efficacy of providing education through the Cahoot platform. We anticipate this pilot will produce positive results in student engagement and learning that would warrant further pilot projects with additional students. 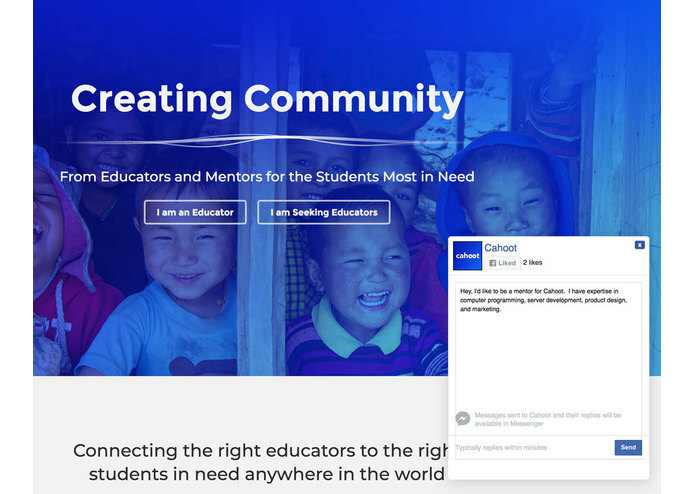 If successful, future integrations with Facebook Groups may also prove to be a valuable environment to source educators and experts willing to lend time and knowledge to underserved populations around the world through Cahoot.